Thanks to overall risk aversion and the BOJ’s decision to keep policy unchanged, AUD/JPY showed strong bearish momentum and is moving closer to my target. As discussed in my trade idea blog post, I shorted on a range breakdown at 77.85 and set my initial stop past the range resistance. Looking back, I can’t help but wish that I had a little bit more patience in waiting for a pullback to the broken range support, as shorting at the 78.50 level would’ve given me a slightly better R:R. Still, I’m not regretting my decision to hop in at market, especially since retracements have been shallow these days. BOJ officials have refrained from making any intervention threats in their policy statement and jawboning from other government officials seem to have fallen on deaf ears. For now, it looks like risk sentiment is the major driving force in the forex market leading up to the EU referendum. But with unprecedented volatility in the markets these days, I’m inclined to protect my profits on this trade. There are still a couple of major central banks set to announce their policy decisions in the next trading sessions, and more Brexit-related updates could lead market sentiment to flip anytime. In line with this, I’ve rolled my stop down to 77.25, locking in 60 pips or a 0.10% gain on this setup. As of this writing, I’m up 160 pips or 0.26% with my short position. 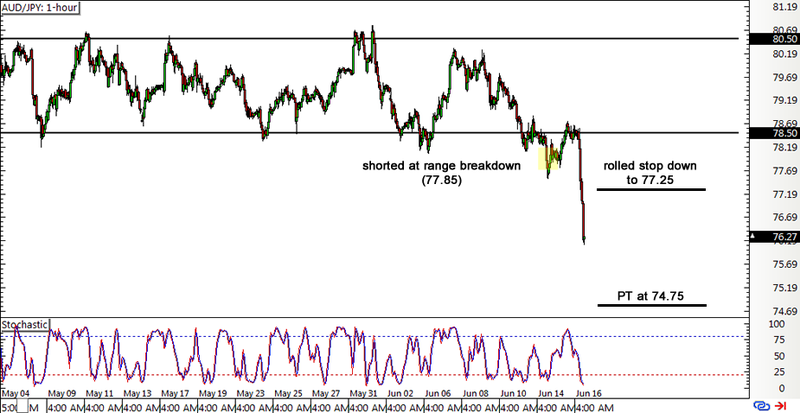 My profit target is at 74.75, which is slightly above a longer-term support level visible on AUD/JPY’s weekly time frame. Remember to never risk more than 1% of a trading account on any single trade. Adjust position sizes accordingly. Create your own ideas and don’t simply follow what I do.